This is my first introduction to Malfrid Gausel patterns and thought you would like to see my finished product as I am very proud of them! I decided to put Bernt and Beate in blue and think they look really attractive. I also decided to finish it off with a hat each. Don't they look cute? The craftsmanship in this work is amazing! the detail is really well done and the dolls look impressed with their new outfits! I love your color choice for these patterns. Your workmanship looks superb. You deserve to very proud of yourself! So nice to see your work. 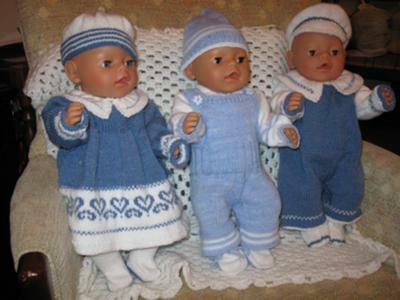 I think the dolls are lovely in blue and white! I am so glad to see these clothes on your dolls! I hope you enjoy making them! Thank you! This is so impressive. I just think they are wonderful and you will find the all of Malfrid patterns are beautifully designed.